For anybody who has watched the sci-fi movie, The Rise of the Planet of Apes, transgenesis would of course be a real concern. In fact, it is actually scary giving the rate at which genetic scientists are modifying everything in the name of improving the quality and quantity of desired characteristics. For those who haven’t watched the movie, let me provide a brief summary. In the movie, a gene therapy drug experiment to find a cure for Alzheimer using a modified virus resulted into mutation in the experimental chimpanzees, making them have a human level intelligence. In the ensuing scenes, a particular ape emerged called Caesar, borne by a genetically-altered female chimp, and developed rapidly in terms of intelligence which is amazingly at human level, and at times above that level. Later in the movie, Caesar ultimately talked. Eventually, the mutated apes revolted, the modified virus wiped out the human race through an epidemic, and the apes, which are somehow resistant to the virus, became the next dominant being on earth. Call it a science fiction movie but with recent advances in the field of molecular genetics and biotechnology, I know it is possible. When the first cloned animal was ‘made’– I can’t use the word ‘born’, can I? –, there was celebration in the scientific world, so much that the animal, a sheep, was named Dolly, after the country singer Dolly Parton for reason still unknown to many including me. These even made the effort at sequencing the complete human genome to continue at a more frantic pace. However, this euphoric feeling was short-lived as the world – of course, through the works of the media/movie industries releasing news and movies about cloning– became aware of the ‘danger’ inherent in cloning a human being. Legislations and ethics were made to curtail these developments, and the scientific community ‘promised’ never to clone a human being. But what that reminded me of are the ‘regrets’ being expressed by those physicists who created the first atomic bomb: it doesn’t stop the production of nuclear weapons till date. So basically, cloning of humans is still a possibility. Anyway, who knows whether it is already being done secretly someplace? But the ethics and legislation still keep them hidden. However, rather than backing away completely from the idea of cloning, molecular biologists and genetists turned to cloning other ‘lesser’ living beings – animals, microorganisms and crop plants – and continue tinkering with their genomes. This led to the coining of the term Genetically Modified Organisms (GMOs), a term now synonymous with controversies in recent years. In reality, the basis of GMOs and/or genetically engineered foods is transgenesis. Transgenesis is the process of introducing a foreign gene – called a transgene – from a different species of living organism into the genome of a different living organism, in order to increase the quantity and/or quality of such organism. While this may look weird to people and maybe a little unconventional, it has resulted into a wide variety of applications of the process including the producing pest-resistant food crops, addition of vitamins fortifications to foods such as rice for malnourished zones of the world, and particularly in understanding the function of so many genes of the human cell. Nonetheless, there are advantages and disadvantages of these GMOs, as well as controversies. Among all these, perhaps the most overlooked point is the development of animals with human characteristics and capabilities. Emphasis has always being on the risks inherent in foods and crops produced by transgenic methods, among which include the development of carcinogens in plants, generation of hypersensitivity reaction by people who are allergic to certain substances produced in the transgenic food crops and many others. Though I am a scientist, specifically a virologist, my own fear came when I saw the picture above. Both rats are litter-mate; one is normal and the other, in the course of an experiment, has been transfected with the gene coding for human growth hormone TGF-beta. This was what resulted into the difference in sizes and of course the name, Muscle Mouse. My initial reaction was: Why human growth hormone? 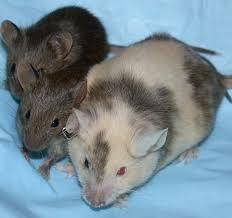 Why not any other less important hormone that potentially wouldn’t result into scary looking rats? Isn’t it possible for a transgenic female rat to give birth to baby rats of which one or more would amplify this characteristic and become bigger than its mama-rat? My concern even grew when I compare the method used on the chimpanzees in the movie I summarized above to real life methods of transgenesis. These methods include: genetically transforming of embryonic stem cells using recombinant DNA; injection of genetic material into the pronucleus of fertilized female gametocyte or germ cell and; among others, the use of viruses (adenoviruses) to transfer the genetic material to the dividing stem cells. The last method is almost the exact technique employed in the Rise of the planet of the Apes! I won’t be surprised if the maker of the film knows too much of molecular biology, especially transgenesis. What if in years to come pets are targeted as the next experimental animals in transgenesis? Maybe tomorrow you try to give your dog a bony treat you know it doesn’t like, and instead of passively refusing to eat it, the dog uses its paw to slap your hand, and with a mean irritated look on its face say something like, “Hey buster, haven’t I told you I hate this scrappy bone?” It would be a horrific amalgamation of scenes from Dr. Dollitle and chapters from the Dean Koontz’s novel, Watchers. I read Watchers a long time ago, and while I actually loved the novel, I dismissed the plot the way I always dismiss the plot of any classic or contemporary horror novel of Dean Koontz. But maybe it is time we start paying attention to those scientific fiction stories and movies produced by the media, because now, anything might be possible with the advent of molecular biotechnology. And maybe genetic scientists and molecular biologists should also slow down a bit and think real good before they clone or modify the next available organisms. I’m not insinuating that GMOs are evil or good – there will always be on-going debates about that by professional debaters, so why join in? –, but there is need for caution because most creations of man have always turned back to haunt him; and I don’t want to be haunted or chased by my pet dog anyway! The reason for this slight warning is quite simple: By the time all these fictional stories start happening, we wouldn’t say we weren’t warned. Just like the caveat of the movie, 2012. You accomplished certain great points there. I did a research on the situation and identified virtually all individuals will go along with with your weblog.